I no longer need two displays on my desk. This is why. Two or more monitors improve productivity, so I’ve generally had at least two monitors. Even with the 21:9 Dell U3415W, I occasionally resorted to a second display when working; having the additional data windows on-screen proved incredibly useful. I found with the 34-inch Dell that I used that second display less often, but still used it on infrequent occasions. For one thing, the 1440-pixel height seemed constraining. 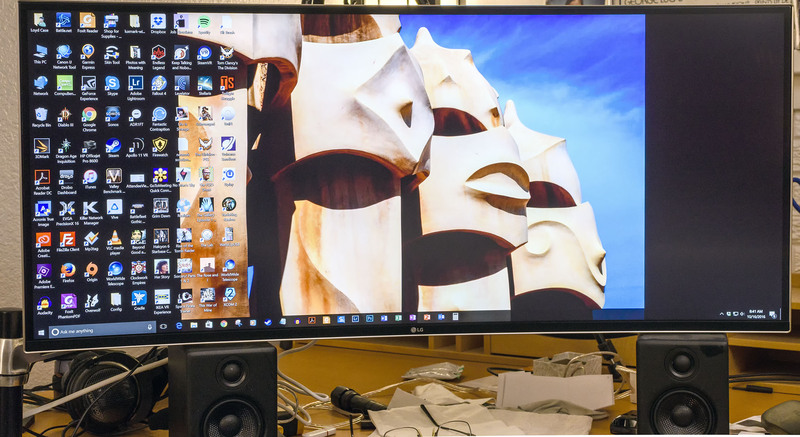 That seems pretty odd when 2560 x 1440 pixel displays have become the norm, but on an ultra-wide screen display, that height seemed off somehow. For one thing, Chrome and windows would open up oddly spaced, with the bottom 5% beneath the display. I found myself frequently moving the Chrome or some app windows up to see the full view. When LG announced the LG38UC99, a massive 38-inch display with a 3840 x 1600 pixel IPS panel, a few months back, techno-lust once again consumed me. I suspected, with no real data to back me up, that the extra 140-pixel height would solve some of my issues. The extra 400 pixels wide wouldn’t hurt either. However, the 35-inch physical width of the display would make using a second display problematic, even on my large corner desk. However, after using the LG for a week, my suspicions were confirmed — I don’t need another display. The added height seemed to help — Chrome now opens properly centered now, for example. I’m sure detailed reviews of the LG will go live relatively soon, but the monitor has most of the features I need. The color fidelity seems good, though I’ll need to calibrate it to use it for serious photography. At six megapixels, game performance seems solid, with frame rates in excess of 60fps the norm if I turn off AA but leave the other eye candy maxed out. Having two megapixels less than a 4K display allows my GTX 1080 to drive the 38UC99 quite well in games. The connectivity options seem mixed: two HDMI 2.0 ports and one DisplayPort 1.2 connection. That eliminates downstream DisplayPort connections… but then again, you don’t really need a second display. The HDMI 2.0 ports only support a 30Hz refresh rate, though the monitor can handle AMD’s FreeSync over DisplayPort up to 75Hz. Since I use an Nvidia-based card, I turn on adaptive vsync in Nvidia’s display control panel which works quite well. The upstream USB connection is a USB-C connector, but LG does supply a cable to connect to the PC. 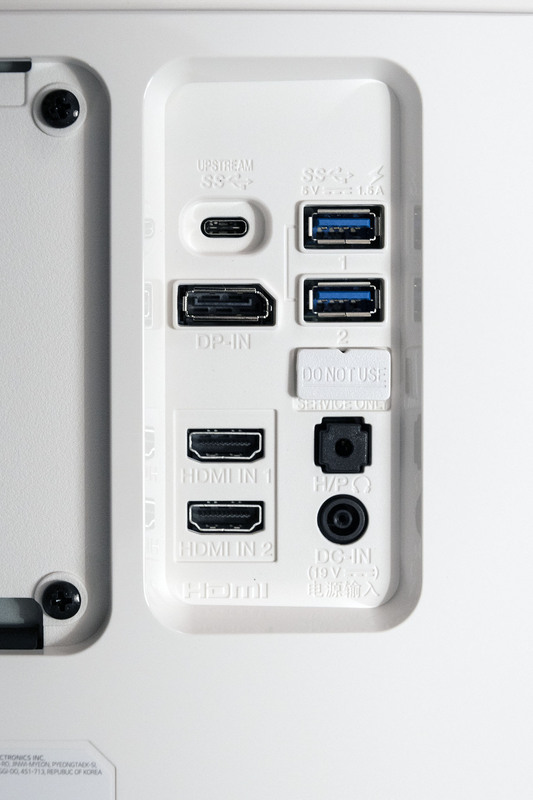 The USB 3.0 ports deliver enough current to charge tablets and high-end smartphones. Oh, yeah, and the display includes built-in speakers. I just turn them off, because they sound quite tinny to my ears. LG even includes Bluetooth support, so you can play your mobile phone music over these fairly terrible speakers. 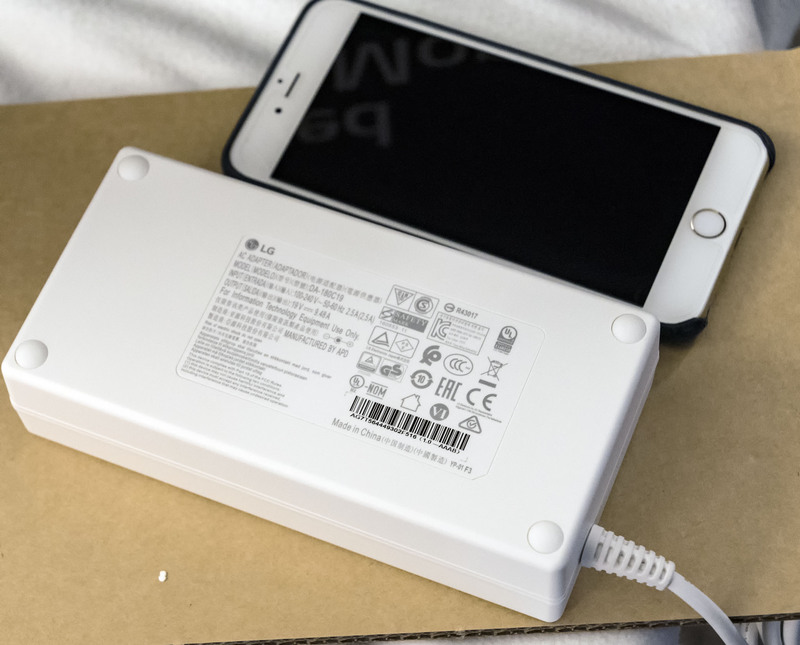 One oddity required by the display lies in the massive power brick, which is as large as some gaming laptop power bricks. The monitor needs 120W while running, but sleep mode is just 1.2W. Of course, there are quirks, as with any new resolution. While the monitor is 21:9-ish, the actual aspect ratio comes in at 2.4:1, just a bit different. So far, I’ve only played Gears of War 4 and Ubisoft’s The Division on the display. Both games recognize the resolution and run fine, but The Division’s built-in benchmark gets thrown for a loop, and will only run in 16:9 format — even though it would run fine at 3440 x 1440. I’m sure I’ll encounter other issues going forward, but such is the price of progress. In some ways, this is me returning full circle. I’ve tended to push the edge of the envelope for single displays for a home computer; after all, I once owned the extremely heavy Sony 24-inch GDM-FW900 CRT. So far, I’m really liking this massive LG display. I may have finally found display nirvana.